We had a wonderful breakfast this morning–eggs, toast, juice, the works. 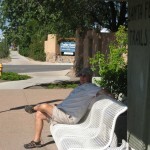 We waited at the bus stop right at our entrance to board the city bus to downtown Old Santa Fe. 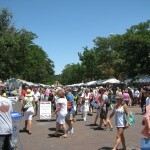 This weekend happens to be a “Spanish Festival” on the square at Old Town. Some folks have told us that there will be a “native american” festival in about three weeks, and it is excellent. At any rate we had no trouble getting downtown on the bus, and by the way, the one way trip downtown was 50 cents per “senior” (that’s us) so it’s a great deal. We took some time getting aclimated to the layout of the town, but it’s basically a square. The buildings are all adobe and the accents on the buildings are very colorful. The people are very colorful as well. I mean their clothing. 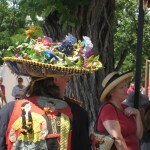 The women especially wear the typical southwestern attire and it is so pretty. Big full skirts, silver belts, big hats. 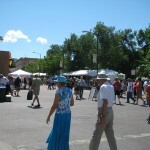 People watching is a great pasttime in Santa Fe. You see all sorts of people, from beautifully dressed women, to street people that are dressed, well, you’ll see by one of my photos. 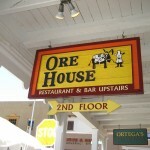 I read about a restaurant (on the internet) in Old Town Santa Fe called The Ore House. I honestly forgot about it until today we were walking down the street and we noticed a line forming. I looked up at the sign and it said “The Ore House”, so since it was about lunchtime, we decided to get in line. Luckily, we got a table right away and it was a delightful lunch. The restaurant is upstairs from the main street and you have a great view of the square. We had a great lunch—I had a chicken taco which was excellent and Greg had a caesar salad topped with grilled salmon. After lunch we walked around and looked at the booths, as well as the stores on the square. 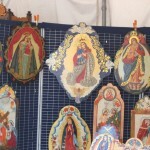 Most of the booths (besides foods of all kinds) were of spanish religious icons which were very colorful. Lots of crosses and all sorts of religious memorabilia. I found another pair of earrings that I just couldn’t do without 🙂 After we had enough of the festivities, we took the bus back to the RV Park (another 50 cents each—don’t ya love it). We took a short nap–don’t ya love it. We saw an Olive Garden restaurant just a block down the street from our park, so we are going to walk there for dinner if it doesn’t rain. Be sure to look at all these photos as the day was very interesting. We leave tomorrow morning heading for Amarillo Texas for the night. Stay tuned. PS We walked to the Olive Garden which was about 10 minutes away. I guess we were hungry and tired. It was the best meal we’ve ever had at the Olive Garden. You may think it’s funny that we ate at the Olive Garden and not another mexican restaurant. To be honest, we don’t like the extremely hot (spicy) food and since Olive Garden was within walking distance, we thought we would enjoy it. 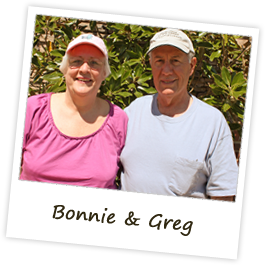 We started by having a nice glass of wine (YES) and we had our usual lasagna for Greg and spaghetti for me. For dessert we had a light lemon cake with cream filling. It was delicious and the perfect way to end the perfect meal. We walked back to the park feeling very mellow!!!!! We are back from our favorite place in Florida and are getting caught up with your wonderful pictures and adventures. We have really enjoyed your blog. Thanks so much for sharing it with us. We had a wonderful time in Longboat Key. The weather was perfect (hot, but no rain). Everyone had a great time and we survived the week with all the family. It turned out to be a terrific time for us all. The grandchildren loved their time on the beach, in the ocean and pool. Madi just had the best time for her very first ever beach experience. We had so much fun watching all the grandchildren having such a good time. All the grown ups had fun also. Of course we ate lots of seafood at all our favorite places, took lots of pictures and videos, and yes took naps whenever we could. BaBa and PawPaw are still trying to get caught up on our rest and sleep. Happy trails, safe travel and good health. 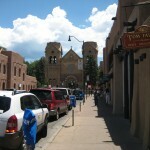 I stumbled across your blog while searching for info on the Santa Fe Town Square. My husband and I are full time Rv-er’s, and I also write a blog, mostly about our adventures, sometimes about whatever is on my mind. We’ve probably passed each other on the road! LOL! We spent 6 days in Albuquerque for the Hot Air Balloon Fiesta. It was our first time for the fiesta, and it was absolutely great! 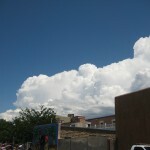 Now we’ve been up in Santa Fe for over a week – had to have the truck worked on (we have a 40 ft. fifth wheel). Tomorrow we had to Show Low, AZ, and will be in Mesa. AZ by Saturday, where we will stay for the winter.